The definitive history of the longest-running comedy programme and sitcom in the world. Quite simply, Last of the Summer Wine is the longest-running comedy programme in the world. It premiered 37 years ago, in 1973, and, after 31 series it finally came to an end last year - even though all its original protagonists - Compo, Foggy, even Nora Batty - are now dead. 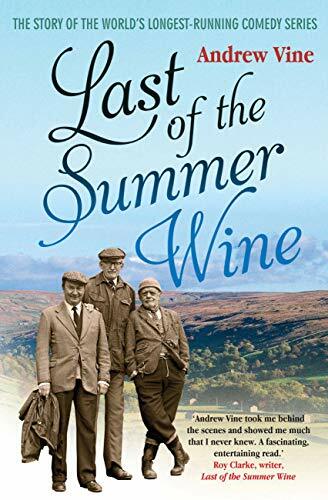 Remarkably, for a series of such longevity and international appeal, it is all about elderly people, has little action or plot, and is set and filmed in and around the small Yorkshire town of Holmfirth. Now, Andrew Vine, the deputy editor of Yorkshire's daily newspaper, has written the definitive history of this television phenomenon. It covers the show's inauspicious beginnings, with low ratings, its endless reinvention as participants like Bill Owen, Michael Bates, Brian Wilde and Kathy Staff retired or died, the appearance of a string of guest stars from John Cleese and Norman Wisdom to Thora Hird and Russ Abbott (both of whom soon found themselves fixtures in the cast), and the ingenious plot contrivances as the protagonists became too old and frail to attempt any of the slapstick stunts with runaway prams - indeed any outdoor action. Holmfirth is now a year-round tourist attraction, and endless repeats and new DVD box sets will ensure a readership for this book for years to come.